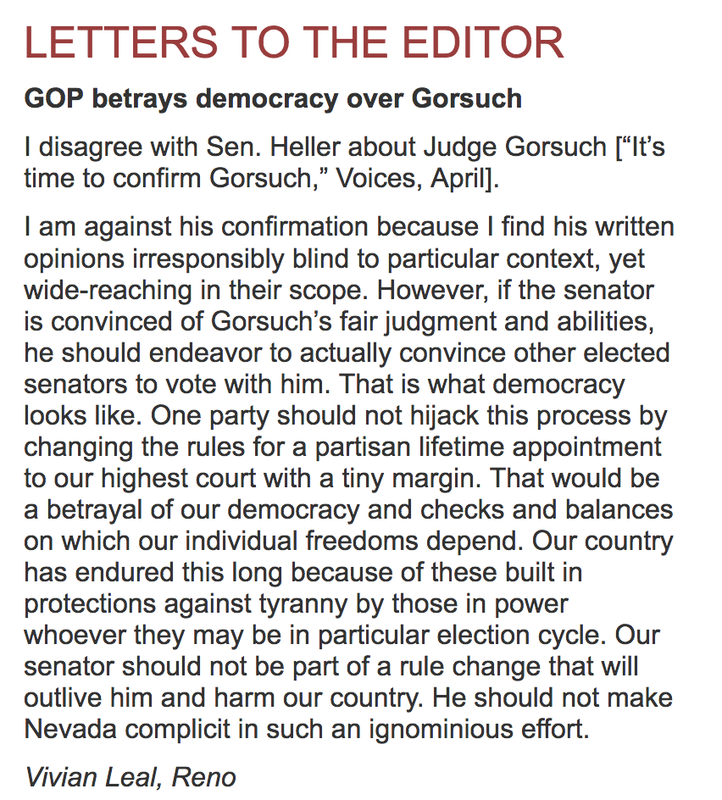 "Senator Heller. We are outside your office. Vote NO." began a campaign to obstruct or veto hard fought bills that affect everyone from veterans to women, students, state workers and the environment. On Saturday, 150 people showed up at the legislature to ask them to stop their blockade. NTDems Coralin, Kathleen and Vivian were there. NT Dems Pam Straley, Steve Dolan and Vivian Leal waiting to testify at the Senate Hearing on AB249 in support of affordable and accessible contraception. NT Dem Pam Straley got a front row seat at the Heller/Amodei Town Hall. Other members including Coralin Glerum were outside, shut out from the event when the room filled to capacity. Vivian Leal lets her voice be heard at the Reno Journal Gazette on two important issues. SB 233/AB249 at the NV Legislature on Monday, March 6th. Passage of these bills would require insurers who want to do business in Nevada to include FDA listed contraceptives in their coverage. The partisan, dysfunctional health care debate at the national level demands we protect our state's financial future ensuring that contraception remains accessible, affordable and enables all Nevada citizens to be responsible, independent, and productive. Stay tuned for follow up actions you can join or support from home. On a snowy day in January, NTD members joined hundreds of women, along with men and children, to march the streets of King's Beach in support of women's rights and equality. The North Lake Tahoe march was one of more than 650 that took place across the nation and world as part of the Women's March on Washington. President Obama visited Lake Tahoe in August and addressed climate change during the 2016 Lake Tahoe Summit. This year's summit was hosted by retiring Nevada Senator Harry Reid. California governor Jerry Brown, Senators Barbara Boxer and Dianne Feinstein of California were also in attendance.